Editor’s Note: This post was originally published November 2016 and updated with the WestJet 2018 schedule. Everyone knows that Hawaii is more than just rowdy Waikiki, picture-perfect Diamond Head and the shops and restaurants that line Kalakaua Avenue. 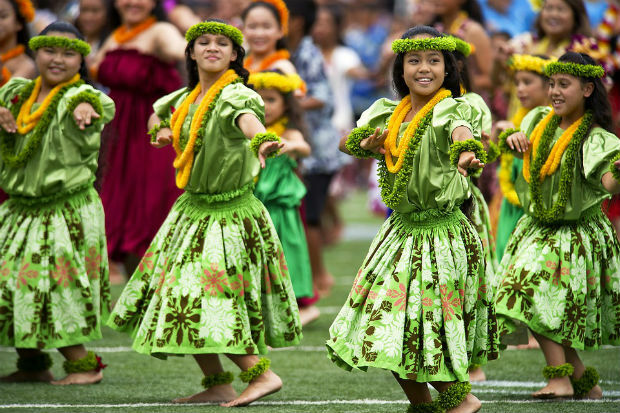 Everyone knows there’s a rich and proud culture that runs much deeper than Aloha, a bronze statue of ‘The Big Kahuna’ and his board on the beach, the lei around necks or the resort booked luaus. Everyone knows there’s jaw-dropping nature, dramatic volcanoes and cascading waterfalls, and sexier hotels than Honolulu’s herd of high-rise havens. Everyone knows there’s peace and quiet to be had in Hawaii. Everyone knows yet not enough seek it out. What exactly are those who choose to stay in the thick of it all missing about Hawaii? Well, everything. The island of Oahu receives over 20 million visitors annually, all entering through bustling Honolulu and most converging on what occupies less than 10 square kilometers of the island. Is it that Waikiki simply has it all? It doesn’t. What it does have however is infectious energy, sublime shopping, a good slathering of restaurant and bar options and one hell of a beach scene. It also has all the comforts of home, and for many, that’s just, well, comforting. It makes Honolulu perfect for families. Between surf lessons, the aquarium and zoo, hiking and history, there’s never a dull moment. There’s even a Disney resort. Having said that, you’d be doing yourself a great disservice if you don’t rent a car here. If not to circle the island for your own slice of paradise, then to at least have access to some of the island’s many great restaurants; and no, they’re not all in Waikiki. North Shore has become synonymous with surfing and is a perfect place to spend the day. Laid-back and worry-free, it’s the ideal place to dig your toes in the sand and exhale. 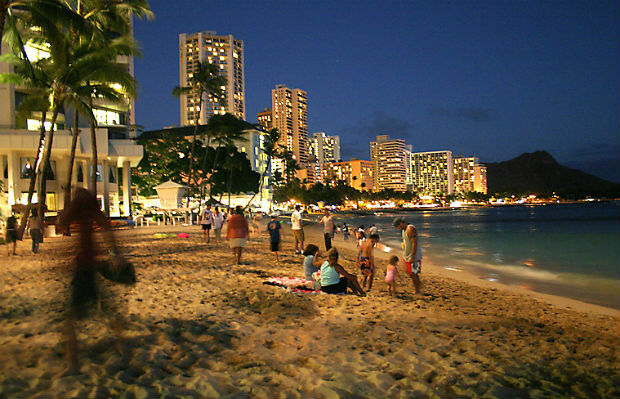 Honolulu is perfect for getting acclimatized to island life. It’s easy here. There’s no culture shock. Many things are recognizable. After all, you’re in a U.S. state. If you’re looking for exotic, you’ll have to move on. WestJet operates year-round service into Honolulu with daily non-stop flights from Vancouver. During Peak season (early December to late April), service increases from one flight per day to two, to handle increased demand. One flight leaves in the morning and one in the early evening, both of which work with passengers connecting through Vancouver from all over Canada. WestJet also operates seasonal non-stop flights from Calgary to Honolulu, with flights commencing on Dec. 11 and ending on Apr. 8, 2018. These flights will operate on Wednesdays and Saturdays and will be operated by WestJet’s first wide-body aircraft, the Boeing 767-300ER. Marketed to the romantic, Maui is the place for couples; Hawaii’s honeymoon island. It picks up where Oahu left off, a quieter extension of the beauty found in Oahu’s less visited corners. Lush rainforests, rolling pastures and crystal clear bays sheltered by protected reefs, the rugged Eastern coast breaking for sweeping beaches in the West, both black and golden. 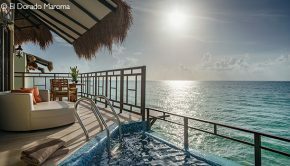 Places to stay range from charming Bed & Breakfast villas and timeshare condos to breathtaking luxury resorts. Haleakala National Park is a must-see. A hike through the desolate volcanic landscape provides an unreal contrast to the rest of the island, and in-season, humpback whales can sometimes be seen from shore. Nearby, the old whaling town of Lahaina offers visitors ample culinary and bar options, nightlife as well as organized whale-watching tours. Just north of there, luxury resort areas of Kapalua and Kaanapali come complete with pristine beaches, world-class golf and enchanting accommodations. There’s windsurfing in Paia, snorkeling off Napili and nature hikes through Iao Valley. The 85km stretch of road between Kahului and the isolated town of Hana is one of America’s most picturesque drives, with 600 hairpin turns, over 50 single-lane bridges and truly spectacular scenery, making a car rental here a must too. If time allows, ferry off to the neighbouring islands of Lanai and Molokai for a truly authentic Pacific island experience. WestJet operates year-round service into Kahului with daily non-stop flights from Vancouver. WestJet also operates seasonal non-stop flights from Calgary to Maui, with service commencing on Dec. 11 and ending on Apr. 28, 2018. 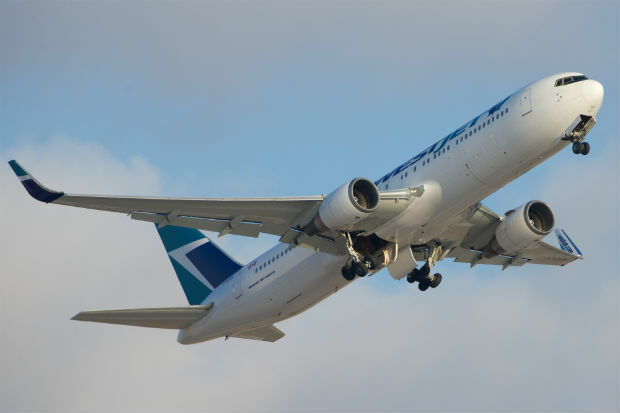 These flights will operate on a Monday, Thursday, Friday, and Saturday and will be operated by WestJet’s first wide-body aircraft, the Boeing 767-300ER. With increased capacity and new equipment, WestJet is the way to go. The airline operates a fleet of Boeing 737 aircraft but with their recent introduction of flights to London, they have added their first wide-body aircraft to their fleet, with several Boeing 767 aircraft. With the reduction of flights WestJet operates to London over winter, the new Boeing 767 will be used to operate direct flights between Calgary and Hawaii. WestJet have 3 fare types to consider when purchasing an airfare. Econo, Flex and Plus fares, each with different value-added features, provide choice and allow you to only pay for what you want to have included when flying. Our Fare of the Month pricing includes inter-island flights between Honolulu and Maui with Hawaiian Airlines. Flying WestJet often? The airline’s popular rewards program is free to join and has a whole host of benefits associated depending on how much you fly. Nature takes centre stage on Hawaii’s striking ‘Garden Island’. Kauai may be the oldest in the archipelago but it’s one of the least explored. Blessed with more sandy beaches than the others, it isn’t hard to find an entire beach completely to yourself. The verdant east coast is spurred on by sporadic rains, leaving it with a forever-green, tropical complexion. The drier southwest holds most of Kauai’s accommodations and attractions. Waimea Canyon, the ‘Grand Canyon of the Pacific’, is truly a sight to behold, with fantastic hiking and camping opportunities at Koke’e State Park, overlooking the canyon. Thousand foot high cliffs race up from the deep blue, piercing the pale sky of the ultra-photogenic Na Pali Coast, the believable location for Jurassic Park. Bring your hiking boots for its network of caves and secluded beaches on bays only accessible by foot or from the sea. You’ve never seen a sunset like you will here. WestJet operates seasonal service into Lihue, the capital of Kauai, with daily non-stop flights from Vancouver. Flights begin on Nov. 27 and run until Apr. 28, 2018. All flights are operated by WestJet’s Boeing 737 aircraft. For passengers coming from other cities in Canada, the flight departs Vancouver in the evening, which allows for convenient connections from anywhere in Canada to get to Lihue. Snow in Hawaii? You bet. Packing the most active volcano on Earth and the twin towers of Mauna Loa and Mauna Kea, it’s easy to see why the island of Hawaii is commonly called the Big Island. 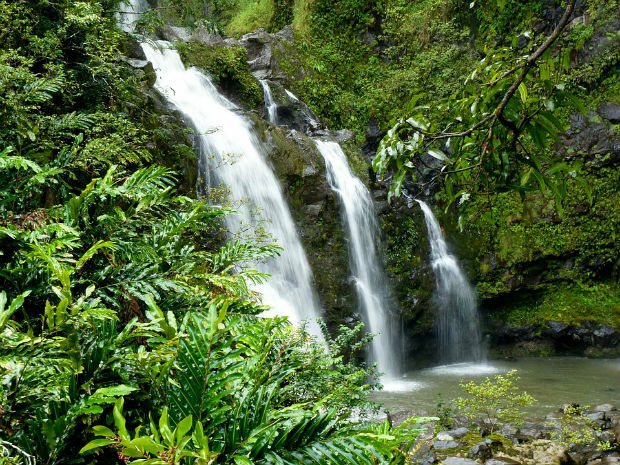 Its capital, Hilo, will lead you to the Amazing Botanical Gardens and numerous waterfalls. On the rainy eastern part of the island, lush rainforest blends into rolling hills best seen by horseback. A challenging hike will lead you over crusty, brand new volcanic earth in Puna, and if your timing’s just right, to the molten lava flowing angrily into the Pacific. Crater hop in Hawaii Volcanoes National Park or tour the coffee farms above Kona. Night dive with giant manta rays or just relax on a green sand beach at South Point. 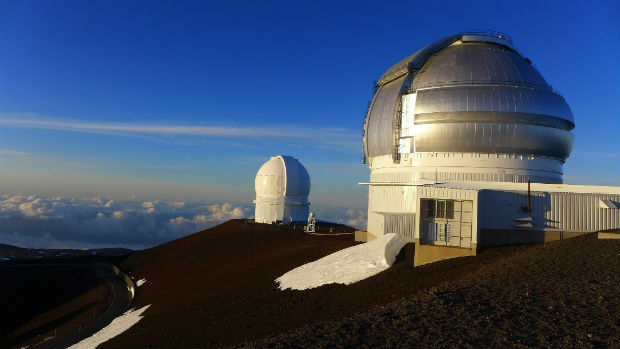 At the summit of Moana Kea, several astronomical observatories dot the lunar-like landscape with neighbouring Maui visible on clear days. Needless to say, your car rental here should be a 4WD. WestJet operates seasonal service into Kona on the Big Island, with daily non-stop flights from Vancouver. Flights begin on Nov. 13 and run until Apr. 28, 2018. 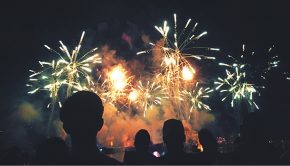 For passengers coming from other cities in Canada, the flight departs Vancouver in the evening, which allows for convenient connections from anywhere in Canada to get to Kona. 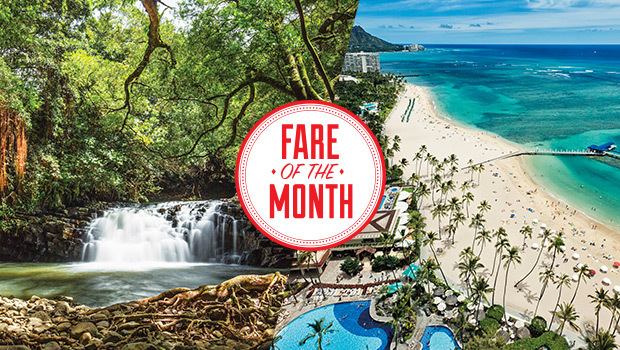 See Hawaii like it’s meant to be seen and price our Fare of the Month from your hometown. Need to add hotels and cars? Enquire online, call us at 1-855-796-8359 or visit your nearest Flight Centre store location today. Daniel Nikulin Daniel Nikulin turned his love of travel into a living and has worked for Flight Centre in various capacities since the late 90’s. 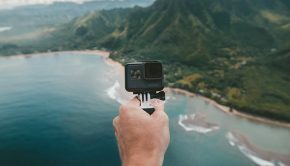 Currently an in-house copywriter, Daniel uses his industry experience to bridge the gap between travel professional and professional traveller. When he’s not abroad with a pen in hand, he spends his time with his band and cat, Leroy.